There is no secret to the fact that all cheese is made in a similar way. It's a process that transforms milk into curds and whey. The whey is drained and the curd remains; this curd is already ‘fresh’ cheese! It can then be strained, pressed, salted or brine washed. It can be eaten young or old, clean or with mould! Producing cheese is both a science and an art and each cheesemaker practices his craft in his or her own unique way. Now, whether this was the result of a happy accident, or by design, no one can really be sure! The one thing we know, is that the production of cheese is an excellent way of preserving milk. The first cheesemakers learnt to transform milk into cheese to ensure ‘the perfect food’ was available all year round. Our ancestors got through lean seasons by preserving meat, vegetables and milk in many inventive ways. Our cows in the glorious Somerset pastures. 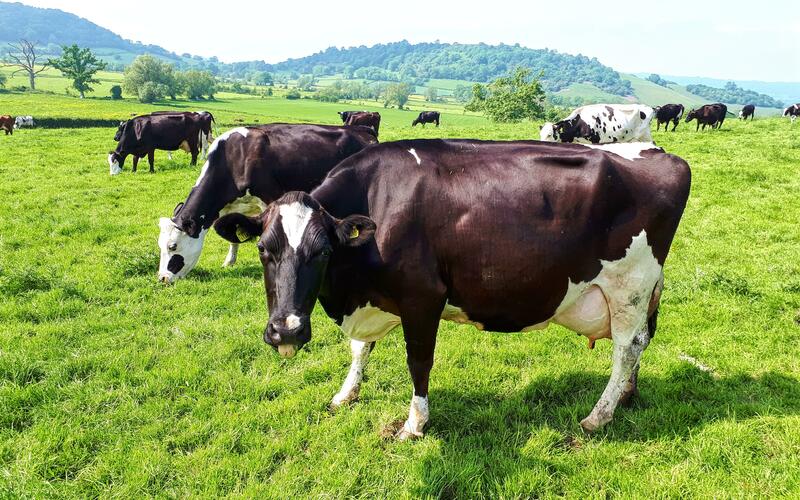 Unpasteurised milk is freshly delivered to our dairy in the village of Cheddar, Somerset, each morning. We source our milk from one local farm, monitoring the quality, composition and temperature of the milk as it arrives. Once our large, traditional open vat has been filled with this milk, we gently warm it. When ready, we add starter cultures - additional (friendly) bacteria and allow the milk to ‘ripen’ for a while. These selected bacteria play a vital role in determining the quality, flavour, body and safety of our cheese. We don't pasteurise our milk, ensuring we preserve the naturally occurring bacteria within it. As a result, our cheese has a more complex flavour than that made from pasteurised milk. Additionally, unpasteurised milk cheese can arguably boost one’s health and immune system, containing more probiotic bacteria, nutrients, vitamins and enzymes which would otherwise be denatured during pasteurisation. This is one of our cornerstones, and we are determined to preserve the heritage of this truly authentic cheddar. The next stage involves coagulating the ripened milk. For this we stir in vegetarian 'rennet', which changes the structure of proteins, resulting in the liquid milk changing to a soft but solid mass - rather like blancmange. Once set, we cut the coagulum. Using traditional handheld frames (some with vertical ‘blades’ and some with horizontal ‘blades’) we gently draw them through the mass which produces small chip like pieces of curd. This releases whey, which holds the floating curds. The curds and whey are then scalded and stirred before being drained. The Cheesemaker’s judgement is vital at this stage, he or she will repeatedly feel and test the curd to make sure it reaches the exact consistency. No industrialised process can ever replicate the art of an experienced Cheesemaker. Once ready, the plug is pulled and the vat drained of whey. The nutritionally rich whey is pumped to our storage silos and eventually collected by pig farmers to feed their livestock. Nothing is wasted! 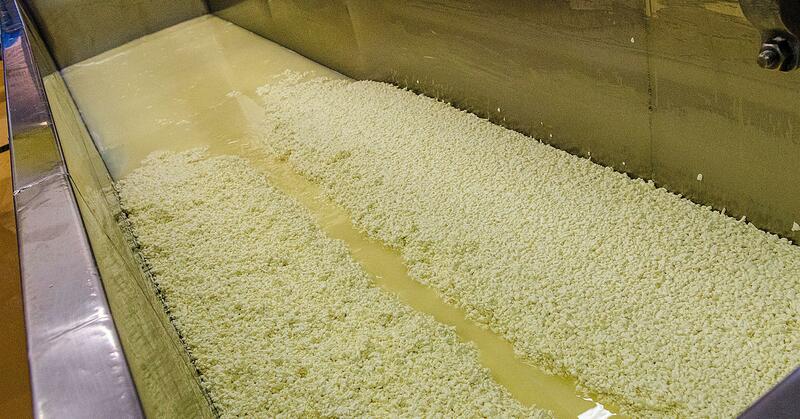 The curd, now settled in the bottom of the vat, must be transferred to our cooling table. Interestingly, the texture starts to change as soon as the whey has been removed; we need to move quickly! 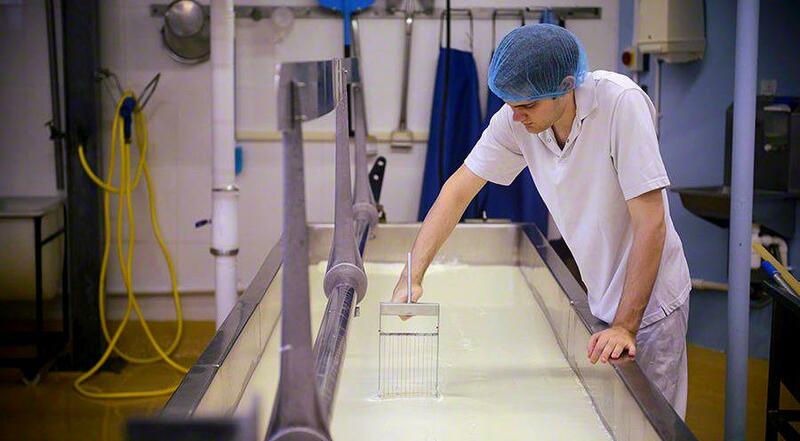 Only once the curd has been transferred to the shallower cooling table can the famous cheddaring process start. This is a unique and essential part of the creation of cheddar cheese. Cheddaring is a critical developmental stage which involves a series of cutting, turning and stacking of blocks of curd, allowing it to cool, drain further and 'knit' together again over a period of time. The cheesemaker monitors the acidity and temperature of the curd closely here. Cheddaring contributes enormously to the final taste and texture of our award-winning cheese. Finally, the curd is milled into small chips before being salted, again by hand. Then we fill our large traditional cheese moulds with the curd ‘chips’ before the cheese within the mould is pressed. After pressing, the whole cheeses are dressed in traditional cotton/muslin cloth before being transferred to the maturing stores. The use of cheesecloth is a vital and historical way of allowing the cheese to gradually dry and develop a rind. Traditional cheese cloth allows the cheese to interact with its atmosphere, ‘breathing’ and allowing vital bacteria to develop. Industrialised, mass-produced cheddar is sealed and matured in plastic wrapped blocks. Our cheese is very different from the everyday cheddar available in the supermarkets today. 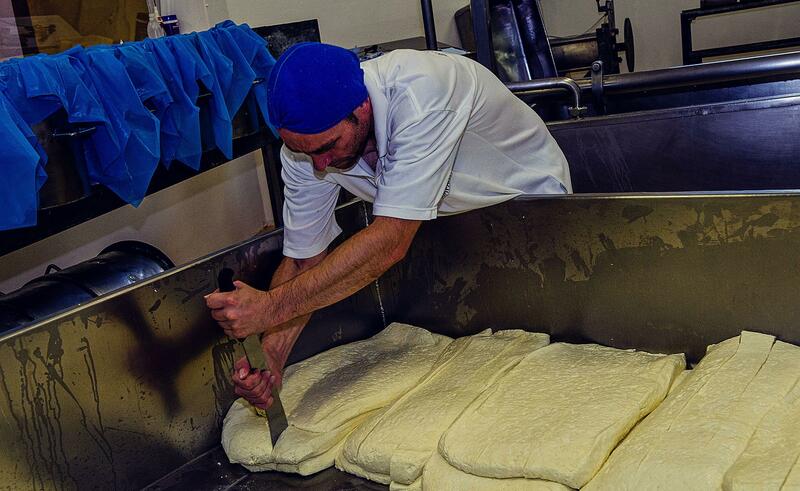 Our whole cheeses weigh around 26Kg and are matured for up to 24 months in our closely monitored maturing stores. Generally, the older the cheese, the stronger the flavour. Our youngest ‘mellow’ cheddars are around six months old. Our oldest, ‘vintage’ cheddar is usually around two years old. 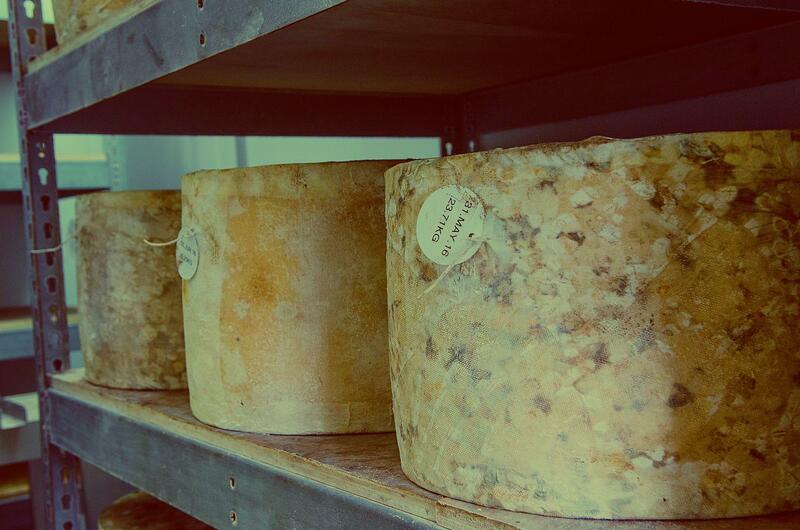 In December 2006, we started maturing some of our cheese in the natural caves within Cheddar Gorge. The environmental conditions were perfect for cheese maturing; constant temperature and high humidity. The environment in which the cheese is matured has a remarkably significant influence on the maturing cheese flavour, texture and moisture. In fact, Gough’s Cave in the Gorge, is the original historical Cheddar Cheese larder. Our Natural Cave Matured cheddar has been an outstanding success; its flavour complex, & truly unique! 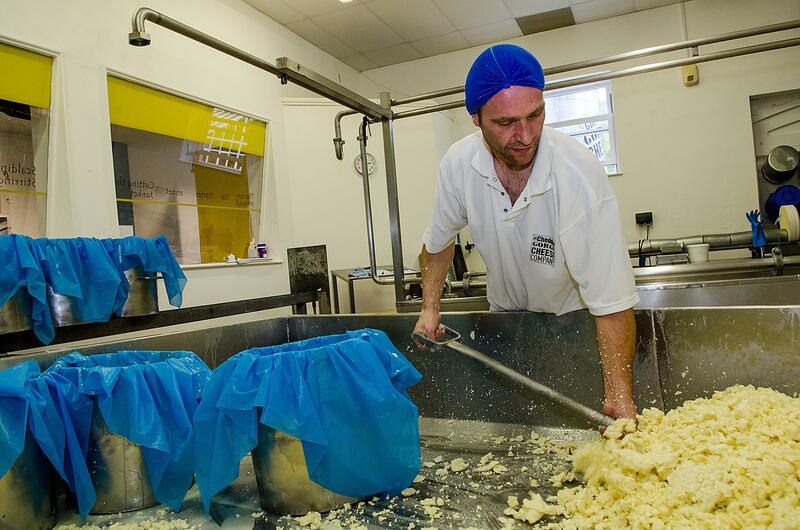 Our Cheddar from Cheddar is history in the making!